An extraordinary tale of endurance and hope, Jon Walter’s second novel is a beautiful and moving story about the power of belief and the strength of the human spirit, set against the terrifying backdrop of the American Civil War. To those classic stories such as Goodnight Mr Tom by Michelle Magorian and The Kingdom By The Sea by Robert Swindells can now be added My Name’s Not Friday. 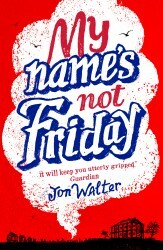 Against an authentic historical backdrop, My Name’s Not Friday is a book of love, survival, belief, loss, loyalty and freedom. I challenge you to read this book and not be in awe. A moving, memorable story of slavery, faith and friendship. Walter's first foray into young adult literature knocks it out of the park... Samuel’s journey is nuanced and engrossing, told in beautiful language and embellished with well-researched details.